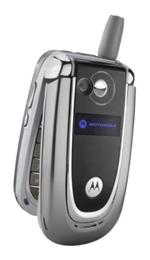 I've had the Motorola V600 cell phone for a few months now, and I love it. Bluetooth, integrated VGA camera, vivid color screen, polyphonic speaker, sleek metallic look, and a strong antenna. It's available now for just $99.99 after rebates from Cingular, which acquired AT&T Wireless a few months back. While I travel around, my phone often reads Cingular now instead of AT&T. One would hope the merger of their two networks would improve overall coverage, and thus far it seems to have fulfilled that to a minor degree. The v600 handles the basic functions of a cell phone well, and that's most critical to me. I've also decided after using all the various form factors that I prefer flip phones. Sure, Verizon probably provides the best nationwide coverage, but why do their cell phones have to be so damned unattractive?